Singer Michael Jackson has launched a website to protest his innocence and speak directly to the world about the child abuse accusations he faces. Mr Jackson was booked over allegations he abused a 12-year-old boy. 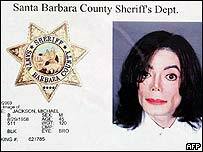 On the site, MJNews.us, he said the charges were based on "a big lie" and he wanted to end "this horrible time" by proving they were false in court. He also said he hoped to cut through media speculation by putting all his official comments on one site. He wrote that the charges were "terribly serious". "They are, however, predicated on a big lie," he wrote. "This will be shown in court, and we will be able to put this horrible time behind us." His lawyers told him there was little he could say and there would be times when he could not comment at all, which would be "frustrating", he wrote. "I have set up this website to serve as a source of official communications on my case," he went on. "Any statement that does not appear on this website must be considered unauthorised. "You are right to be sceptical of some of the individuals who are being identified in the mass media as my friends, spokespeople, and attorneys. "With few exceptions, most of them are simply filling a desperate void in our culture that equates visibility with insight." He added that he would not provide "running commentary on every new development or allegation du jour" and intended to argue his case in court, not in the media. He ended the signed statement by thanking his fans, friends and family for their "support and understanding". Mr Jackson is currently free on $3m (£1.8m) bail after turning himself in to police on Thursday. He faces multiple charges of "lewd or lascivious acts" with a child younger than 14. The charges are thought to relate to one child and carry possible jail sentences of three to eight years each. He is now in Las Vegas, where he is filming a music video, and is due in court in Santa Barbara, California, on 9 January. 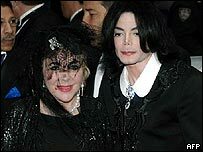 Meanwhile, screen legend Elizabeth Taylor, a friend of Mr Jackson, said on Sunday that the star was "absolutely innocent". The actress also attacked the press over how they portrayed the singer. "Their whole reaction is that he is guilty. 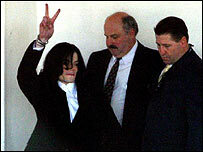 I thought the law was 'innocent until proven guilty'," she said, adding that Mr Jackson would be "vindicated". It was the first comment from Taylor, a long-time friend of the star, since his Neverland ranch in California was searched by some 60 officers on Tuesday. Fans of Mr Jackson held candlelit vigils around the world on Saturday, but they failed to attract large crowds. Mr Jackson's album Number Ones - largely a collection of his biggest hits - topped the UK charts on Sunday. He released his latest single, One More Chance, on Monday. "His family say they are outraged at the allegations"